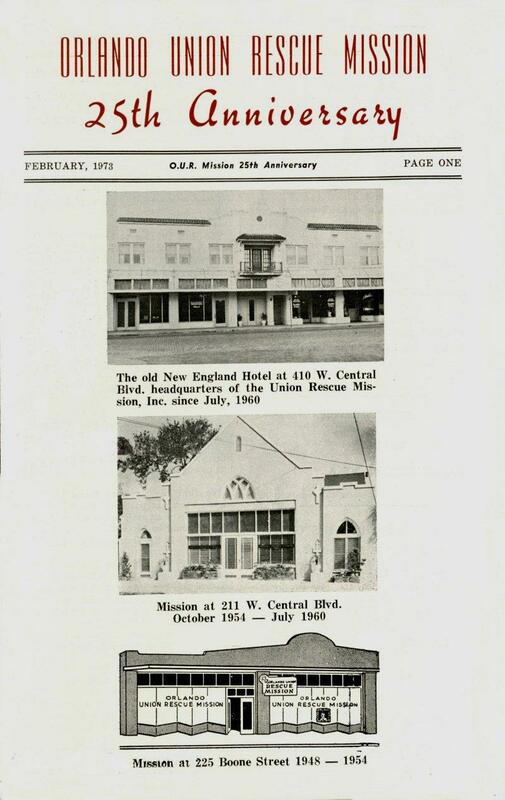 In February 1973, the Orlando Union Rescue Mission celebrated their 25th year of meeting the needs of the less fortunate in the city of Orlando. 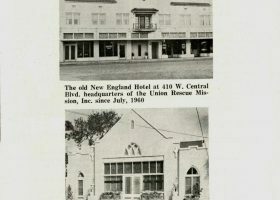 An eight-page brochure was published to commemorate the event and features photographs of buildings, the bargain store, Sunday School, holiday food boxes, kitchen and key individuals. Names mentioned in the brochure: Rev. John W. Horan, Mrs. James A. Booker, Locke P. Miller, A. L. Batts, John P. Lowry, Esther M. Horan, M. D. Rice, Joseph P. Rutland, F. C. Ault, Ivan D. Morgan, Dr. William E. Dill, Wilson M. Reed, James A. Dixon, Mrs. M. D. Rice, Fred Falkner, Dr. Don C. Robertson, Russell S. Hughes, Ralph Roser, Charles L. Hendrick, Donald T. Senterfitt, Mrs. Eugene Kelsey, George Stuart, Ralph C. Meloon, M. J. Wiggins, Walter Menges, H. B. Austin, Joseph P. Rutland, S. B. Peele, C. E. parsons, C. P. Martin, J. P. Lowry, George L. Stuart, M. J. Wiggins, Rev. Harry Moore, Pat Withrow, Mr. Banks, James A. Booker, Mrs. Clarice Sellers, Mrs. John W. Horan, Philip Horan, Robert Horan, Donald Horan, Eugene W. Kelsey, Mr. Hilding E. Halvarson, Mr. Walter Menges, Dr. Torrey Johnson. The Orlando Union Rescue Mission continues to serve the less fortunate people of Orlando. Visit their web site to see what they are doing and what you can do to help. This item is in the Orland Rescue Mission file at the Orlando Public Library. This item is located in the Orlando Rescue Mission file at the Orlando Public Library.